How would you answer if presented with the question, “What are you thankful for about Charleston?” What if you were asked to use one word (or at least less than three)? Yes, well, the team at 9 Broad Street was similarly flummoxed; however, in the spirit of the season, eventually complied (mostly, kind of). “I am thankful for many things about Charleston. One of the top on my list is being thankful that Charleston is such a walkable city.” Certainly being able to get to most of where you need to on foot is convenient, but it also contributes to how we interact with each other. Walking around, like porch sittin’, allows us to get to know and appreciate our neighbors, wonderful as they are. “Vibrant history...” Yes, absolutely, we are all thankful for Charleston’s wonderful history, but sometimes it’s necessary to be reminded of things we might otherwise take for granted. Thank you. What about Charleston’s authenticity? Yep, most would agree that Charleston has remained true to its own personality, spirit, or character, despite external forces, pressures and influences which are very different from, and other than, itself. Well done! “Local truck farmers--fresh butter beans, collards, okra, and tomatoes.” Clearly, this individual has difficulty in a) following instructions, b) making choices, or c) both. However, the sentiment is sincere and therefore duly noted, and the respondent shall remain anonymous to all of those who don’t know Lois. 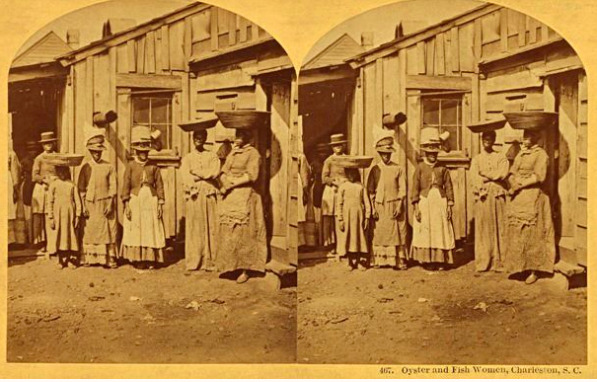 Oyster and Fish Women, Charleston, SC circa 1870 from South Carolina Oyster Industry: A History by Victor G. Burrell, Jr. Among the rest of the answers, a theme seemed to emerge: oysters, tabby, and water-creeks-harbor-beach. Since Charleston is said to be where the Ashley and the Cooper meet to form the Atlantic Ocean, water is a huge part of life in Charleston and always has been. So have oysters. 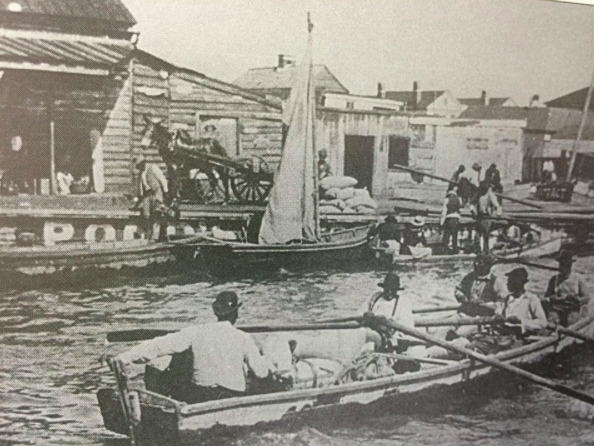 In 1680, settlers moved from Albemarle Point to Charles Town’s current location aptly named Oyster Point (and the later park at the tip of the peninsula was named White Point Garden) for the abundance of oyster shells there. Native American shell “middens” (prehistoric heaps of discarded shells) were abundant in the Lowcountry and often the source for the shells needed to make tabby. Tabby is a concrete-like mixture of oyster shells, sand, lime and water used to construct foundations, garden and cemetery walls, and even entire structures. Predominantly found on the sea islands, early examples of tabby remain scattered throughout the Lowcountry and represent one of the most sustainable local building materials in our region. It is unclear how many tabby ruins are in Charleston County, but Tabby Architecture was added to the Preservation Society of Charleston’s2012 Seven to Save list in an effort to categorize and save them.